The mule deer is indigenous to western North America. It is named for its ears by Lewis and Clark, which are large like those of a mule. Mule deer were common in western states at the time of early settlements, although not as abundant as today. In many western states, mule deer harvest was unrestricted until after the turn of the twentieth century. Early in the 1900's states began to restrict mule deer hunting to bucks only. Soon game managers began to realize the need for antlerless harvests in order to keep the deer herds in balance with the habitat. Following herd management techniques, a balanced harvest between bucks and does was once again established in most states. Populations continue to vary between areas due to weather, habitat and predator relationships. Mule deer (Odocoileus hemionus) are easy to identify due to their large mule-like ears. They are brownish-gray in color, have a white rump patch and a white tail with a black tip. Mule deer may live 9-11 years in the wild (but usually don't due to hunting, weather and predators) and can live to be much older when in captivity. Mule deer have excellent binocular vision. While unable to detect motionless objects, they are extraordinarily sensitive to moving objects and can see very well. They have incredible hearing and a great sense of smell. A mule deer's life typically begins in May or June. The mature doe's will often give birth to twins, while yearling does generally only have one fawn. Fawns will usually stay with their mother for the first year of their life. Harsh winters take a major toll on young fawns. As the temperature drops and the snow begins to pile high, these small deer have a very difficult time surviving. Predators such as cougars, bobcats and coyotes are always looking for the weak and old. These threats combined with winter ranges that may have diminished food sources, put the fawns at great risk. For many mule deer, the first winter is often the most difficult. By spring these deer are very lively and ready to move to higher ground. Mule deer return to their summer ranges as soon as the snow starts melting and temperatures begin to warm. Antler growth typically begins in March, April or May. Yearling bucks will often sport a spike or two-point frame for the first year of their life. Genetics, nutrition and age have much to do with antler growth. During spring and summer antlers are growing at an tremendous rate. If summer ranges are in good shape, those antlers should grow very well. The most noticeable differences between white-tailed and mule deer are the size of their ears, the color of their tails, and the configuration of their antlers. In many cases, body size is also a key difference. The mule deer's tail is black-tipped, whereas the whitetail's is not. Mule deer antlers are bifurcated; they "fork" as they grow, rather than branching from a single main beam, as is the case with whitetails. Each spring, a buck's antlers start to regrow almost immediately after the old antlers are shed. Shedding typically takes place in mid-February, with variations occurring by locale. 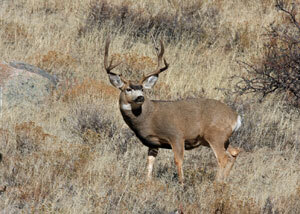 The mule deer is the larger than whitetails on average, with a height of 31-42 in. at the shoulders and a nose-to-tail length ranging from 3.9 to 6.9 ft. Adult bucks normally weigh 121-330 lb., averaging around 203 lb., although trophy specimens may weigh up to 460 lb. Does are rather smaller and typically weigh from 95 to 200 lb., with an average of around 150 lb. Unlike the whitetail, the mule deer does not generally show marked size variation across its range, although environmental conditions can cause considerable weight fluctuations in any given population. The social system of mule deer consists of clans of females related by maternal descent. Males disperse as individuals or aggregate in groups of unrelated individuals. During winter and spring, the stability of female clans and male groups is maintained with dominance hierarchies. The frequency of aggressive behavior between the sexes remains low year round in mule deer. Mule deer consume a wide variety of plants, and their preferences vary widely geographically as well as seasonally, but they are primarily browsers on woody vegetation and eat relatively little grass. However, they readily adapt to agricultural products and landscape plantings. In summer, mule deer chiefly forage on not only leafy plants, but also various berries (including blackberry, blueberry, salal, and thimbleberry). They also use grasses more than in winter. In winter, these deer forage on conifers (especially Douglas-fir, cedar, Taxus yews, and juniper) and twigs of deciduous trees and shrubs (esp. aspen, willow, dogwood, serviceberry, and sage). In season, they eat acorns and apples. Over much of the species range, snow and ice cover many food sources and the food that is accessible grows slower. The deer's metabolism slows and individuals become less active to survive in an environment with less food. A large fraction of the deaths in a mule deer population occur in the winter, especially during the first year of life. The estimated rate of food intake is about 22 g/kg body weight/day. In adult males, food intake drops abruptly with the onset of rut. The "rut" or mating season usually begins in the fall, mainly from late November through mid-December, as does go into estrus for a period of a few days and males become more aggressive, competing for mates. Does may mate with more than one buck and go back into estrus within a month if they do not settle. Courtship and mating occur within the group. A dominant male tends an estrus female until mating or displacement by another male occurs. Dominance is largely a function of size; with the largest males, which possess the largest antlers, performing most of the breeding. The gestation period is about 190-200 days, with fawns born in the spring, staying with their mothers during the summer and being weaned in the fall after about 60-75 days. The peak birth period is estimated to be from June 16th to July 6th, with most births occurring in June. Mule deer females usually give birth to two fawns, although if it is their first time having a fawn, they often only have one. Most females conceive during their second year and only rarely during their first year.